Hello, friends! It’s Sarah here. I’m so excited to take over The PlayGround’s blog today to share another aspect of wellness—early development! 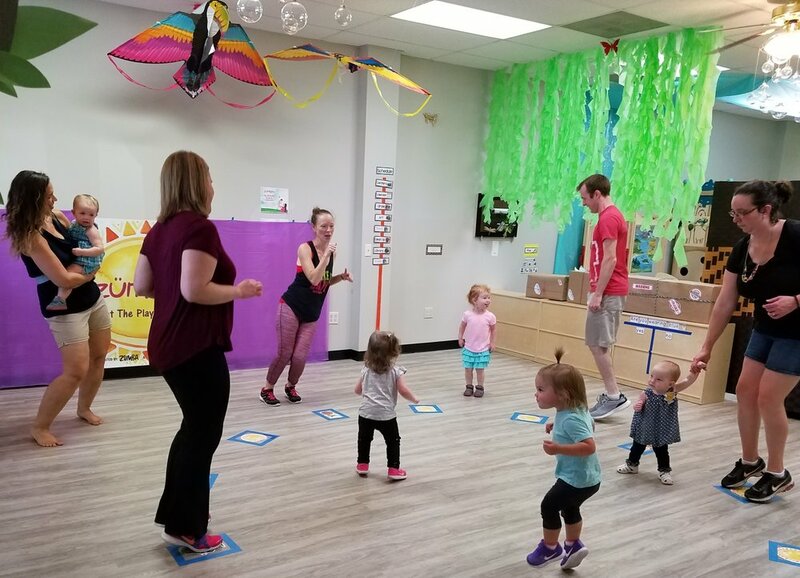 Did you know that while you’re having so much fun in Zumbini®’s inviting, community atmosphere, you’re also helping your child develop the skills necessary to use scissors, color in the lines, write, button, and even type? These are skills that I often hear are lacking as preschoolers and kindergarteners enter school. That’s right, we’re talking about all of those amazing fine motor (small muscle) movements that are necessary in life. Zumbini® offers so many excellent opportunities for fine motor practice—from hand and finger motions during songs, to handling scarves and playing instruments. But let’s take a moment to talk about how the gross motor (big muscle) side of Zumbini® is helping to set your child up for fine motor success. As children grow, their big muscles are the first to develop. This is why we see a typical progression, or motor sequence, from head control in early infancy to eventual standing and walking as children enter toddlerhood. Once big, core muscles strengthen, subsequent muscle groups are able to build in the arms and legs. Finally, those small hand and finger muscles strengthen enough to grasp objects. With practice, grasping can ultimately develop into proper scissor and writing implement grips and bimanual control (using both hands). So, while your preschooler is seated to cut/draw/write, (s)he is using finger/hand/arm muscles to perform the task, holding (her)himself up with core muscles, and stabilizing by resting or pushing feet against the ground. All of the jumping, twirling, dancing, drumming, shaking, clapping, etc. integral to the amazing choreography in the Zumbini® program provides your little one the opportunity to build those big, gross muscles. Even our youngest friends sitting in their caregivers’ laps and bopping to the music are working their muscles! By safely strengthening the big muscle groups at an early age, the smaller muscles will then have a strong foundation upon which to build—something that can be bolstered through practice. While we all have our own reasons for choosing the Zumbini® program, its many wonderful benefits (more posts to come!) affect each child-caregiver pairing. Most importantly, the first five years of a child’s life are crucial to building a strong foundation for their future growth, and by participating in this program, you have prioritized your child’s early development. That is something to celebrate! Are you interested in early childhood development and fun ways to help your child grow? Feel free to leave a comment and share this post. Like us on Facebook to see all of the fun ways we incorporate learning into playtime! (c) Copyright 2016 The PlayGround - a divison of AgriCouture, LLC.